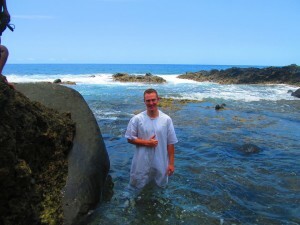 We received a surprise email from our son in the Vanuatu, Port Villa Mission. Given the large cyclone that had recently hit, I didn’t think we would hear from him for a few weeks. I have posted updates on this site (referring to Missionary Mommas on Facebook) from time to time, but for those who haven’t seen them, I will briefly summarize my son’s past few months. Elder Jones has now been out almost 18 months. He has previously served on the islands of Tanna, Santo, and Gaua. He served as branch president for the whole island of Gaua for nearly six months. During his time on Gaua, he had no regular email or post mail service so we only heard from him every 6 to 8 weeks, which was a tough time for my wife and (I). A few weeks ago, he was transferred to the island of Guadalcanal of the Solomon Islands to be one of only 2 zone leaders of the entire country. The Solomons are part of the Vanuatu Mission, yet they are a separate country, requiring Colten to have his VISA revised. In the Vanuatu islands, he spoke the native language of Bislama, but now that he is in the Solomons, he is having to learn the new language of Pijin. The Church has only been present in the Solomon Islands since the mid 1990’s, and there are only about 500 church members so far. 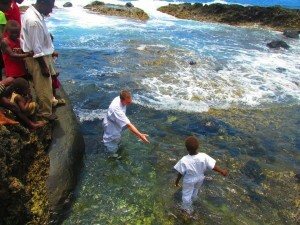 Colten said that their baptism goal for the Solomons this year is 200, and they are about halfway there. Colten said the people are very receptive to the gospel and they have baptism almost every week. Colten is living in the city of Honiara on Guadalcanal. This was the site for one of the fiercest battles of World War II in the Pacific. I am a high school history teacher, so I was very excited to hear that he is serving in such a famous part of our country’s history. Colten said that the people of Guadalcanal love the American people for their service to them in the war. Colten said he has had several people approach him on the streets, and ask if he is American. When he tells them that he is, they grab his hand with both of theirs, and with deep emotion thank him for what his country has done for them. Church members also often tearfully thank him for bringing the gospel to their country. Colten said the way the people act, it is as though he personally won the war and restored the gospel. The Vanuatu Mission has received a lot of news coverage lately because of Cyclone Pam that ripped through the islands last weekend. The Solomons were the first to be hit, but they didn’t get the full force of the storm. There was some damage done to the Solomons, including a church that was leveled, but Colten didn’t think anyone had been seriously hurt. He said the storm brought heavy rain and very strong winds, but they had been given a few days’ notice to seek shelter. I asked Colten where he found shelter to ride out the storm, and he said he and his comp(anion) didn’t think the cyclone was bad enough to stay home so they spent their time during the cyclone with their umbrellas and a box of Book of Mormons in the streets of their area. Just before the cyclone hit their island, they held a baptism for one of their investigators. He said it was a very powerful moment in his life to see the gathering storm clouds of the cyclone on the horizon and at the same time see another one of God’s children being rescued from the storms of life through the waters of baptism. Colten has 6 more months in the islands of the Vanuatu Mission. In the past 18 months, he has had some amazing, scary, and unbelievable experiences. I have said several times in the past 1 ½ years that there can’t be much else for him to experience, but I have been repeatedly proven wrong, so I don’t say that anymore. When he was set apart by our stake president in what feels like forever ago, the president said that he had known Colten for a very long time and that he had come to know that Colten has always been capable of doing hard things in life. The president then went on to say that in the 2 years he would be serving the Lord in the Pacific islands of Vanuatu, he would be called upon to do many more hard things. I had no idea then how true that stake president’s words would become. My wife and I did raise our son to do hard things and we did have high expectations of him. However, as he spent his first 18 years of his life with us, I never dreamed of how much he would be tested, strengthened, and refined as missionary and a man in a mission that I had previously never known existed. This missionary experience was posted by Ryan Jones, Elder Jones’ father, on the Missionary Mommas Facebook page on March 18, 2015. It is reprinted with permission.